The first item The Herd had to overcome was building something tall and thin. Initially there were issues with the raft adhering to the base plate. We overcame that with an adjustment to the heat of the raft and re-sanding the plate to a slightly rougher surface. The second challenge was that there were some items about the Axion code that were preventing the build from succeeding given the small diameter and 15 cm height. Vernon & Riley worked with the code to change the profile and finally (after about 5 tries) got the first rocket to print. Vernon’s success first build spurred our friend Riley onto thinking about further possibilities for his design. Riley has spent a bit of time doing archery and helping me build arrows. It occurred to him that if he could give a helical twist to the fins for his rocket that he might get better stabilization in flight. 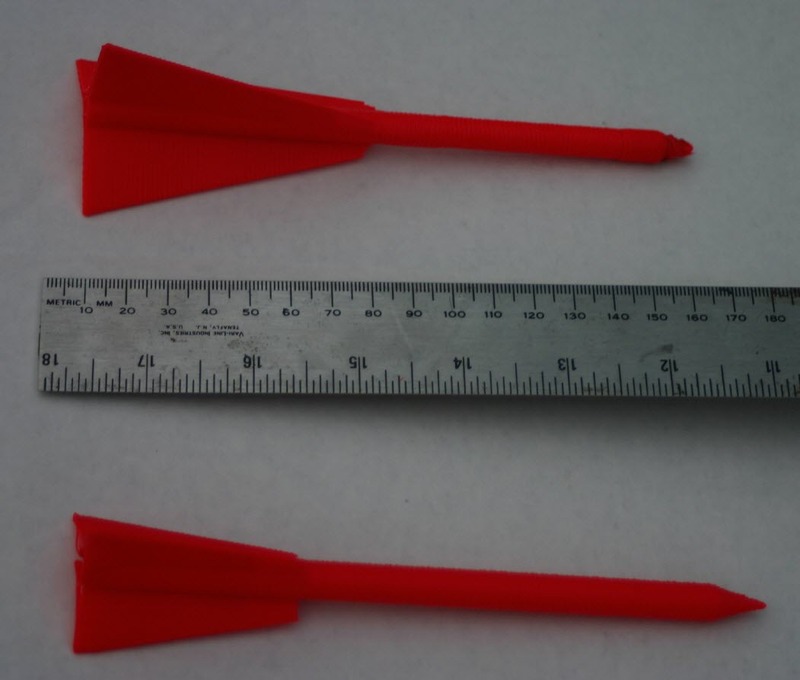 So after a bit of work, he was able to print a rocket body with fins that “should” stabilize the rocket in flight. Riley also did some modeling with SolidWorks on the potential turbulence and airflow around the designs. He feels that the stabilization provided by the helical fins will offset potential problems that the model might have. So, after an afternoon’s worth of work, we had two modestly different designs that are the tallest items we have printed to date. We did encounter some issues with the nose of the second rocket as it finished, the rocket “rocked” a bit as it was printing and gave a less than perfect finish. We will look at ways to stabilize the printing of these objects as we move forward. We have built up a small chemistry lab and had good initial success cooking motors from KNO3, Sugar, Corn Syrup & some additional additives. This weekend we will cook up a batch, fill the rocket bodies an attempt a launch from the DCS Annex Lab. This will combine all the elements we have been working with into a neat package. SolidWorks for the rocket design (and potentially failure analysis), 3D Systems for the physical build, Boxx technologies for the processing horsepower & a lot of perseverance from The Herd to put it all together. Look for our launch attempt soon.